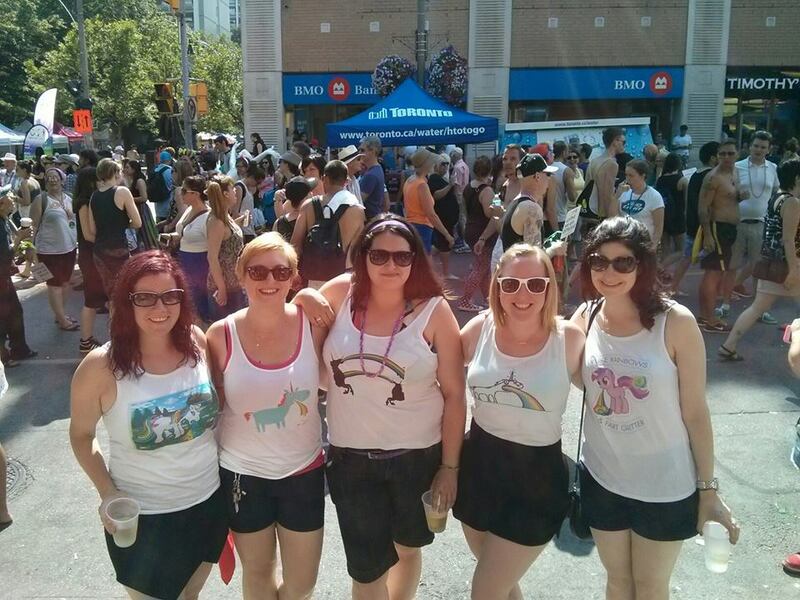 The past 72 hours were the biggest stoop event of the summer: World Pride weekend. I live in the heart of the gay village, and every year my stoop/entire apartment turns into Pride headquarters for all those near and dear to me, my roommate, and our downstairs neighbours. My closest friends and I gear up for it in advance with custom T-shirts. Inequality…ain’t nobody got time for that! Our majestic herd of rainbow-puking unicorns. And they’re newlyweds to boot! Now if you saw me this weekend (apologies if you did and I don’t remember), you would be forgiven for thinking the weekend is just an opportunity for a never-ending stream of wine (seriously, next year I should just hook the box of wine into my arm via IV and roll it around behind me on a little cart). While the partying and the booze are a big part of it, Pride is much more than just an excuse to get wasted (it’s not like I need excuses; any day that ends in ‘Y’ is a day to drink). I realize this could easily go down the path of the bi white girl who co-opts Pride and makes it all about me, but this is my experience and I wanted to share it. The first year I attended, I was in a very odd place personally. I had gained a bunch of weight in school, wasn’t comfortable with who I was, and felt very out of place in Toronto. I would barely leave the house without wearing as much clothing as possible, but faced with the extreme heat and a full day in the sun, I swallowed my anxiety and ventured out in shorts and a tank top. As soon as we got to the heart of the festival, all my insecurities and worries melted away. I got it: Pride was about celebrating love, no matter what you look like, no matter who you are, no matter where you come from, and no matter whom that love is directed towards. I have yet to find a more welcoming environment than Pride in Toronto. 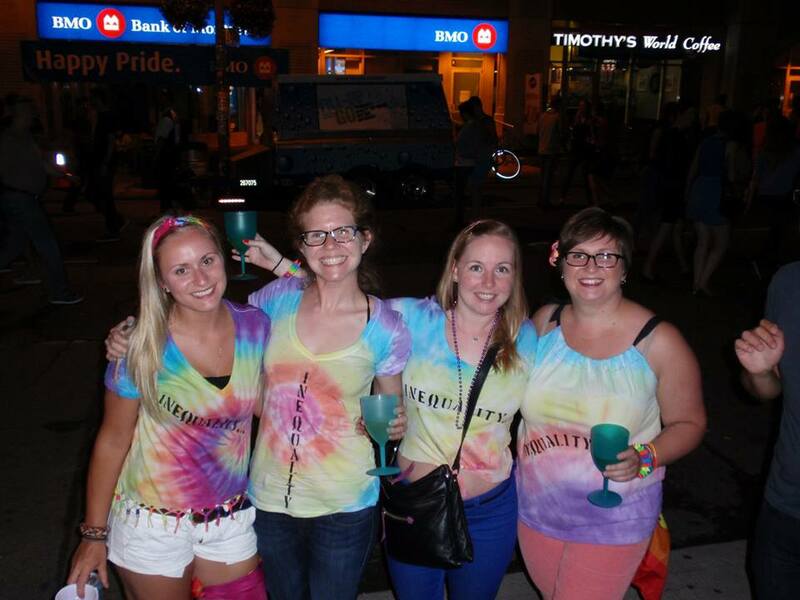 My first Pride experience led me to volunteer the following year. Since I have my Smart Serve, I ended up working at a beer tent in one of the gardens. It sounds glamourous, but I really just hauled cases of beer out of a truck. Even so, I loved it. I went to the now-defunct Play after, and had a heart-warming conversation with a man from South America who talked about his love for Canada and how he could really celebrate who he is here (also a great little Canada Day shout-out). 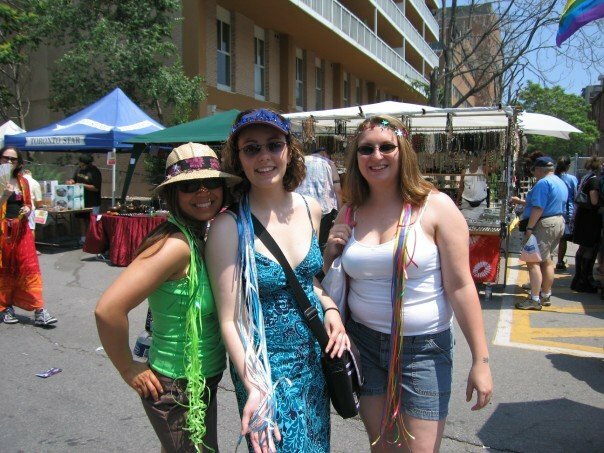 My last ‘big Pride experience’ took place the year before I moved into the gaybourhood. I already mentioned I used to work for an online dating company, and one of our sites was exclusive to gay men. We decided to hold a contest to marry couples from all over on a float during the parade. 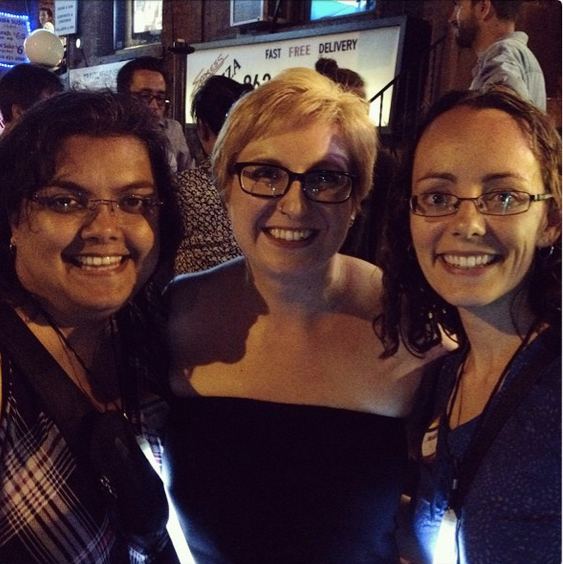 I ended up meeting 12 of the loveliest people (some of whom I still keep in touch with to this day). It was so great to be part of their day: seeing people in love celebrate their lives together, especially since many of them were from states where gay marriage was/is still illegal. Also, if you’ve never been on a float while people are getting married to the adulation and encouragement of thousands of screaming well-wishers, I would highly recommend it. I’ve watched people I love worry about losing friends or upsetting people by coming out (it actually fills me with rage that this is a real struggle); I’ve seen and heard hurtful words from family members under the guise of love (pro tip: it’s not loving if you try to force someone to be someone they are not just to make you more comfortable); I’ve heard firsthand accounts of the vilest things a human can say to another; I’ve watched news reports of violence and suicide in horror. That’s why events like Pride are so important: they meet this hatred and fear with joy and love (and a lot of glitter). As the very wise Jack Layton said (whom I’ve quoted here before): love is better than anger. Hope is better than fear. Optimism is better than despair. So let us be loving, hopeful and optimistic. And we’ll change the world.